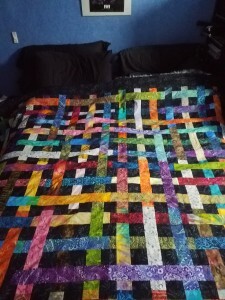 Some time ago I decided I wanted to make this quilt. Well OK the original is not quite the same proportions but close enough. I followed the idea but with bigger starting rectangles of the background. 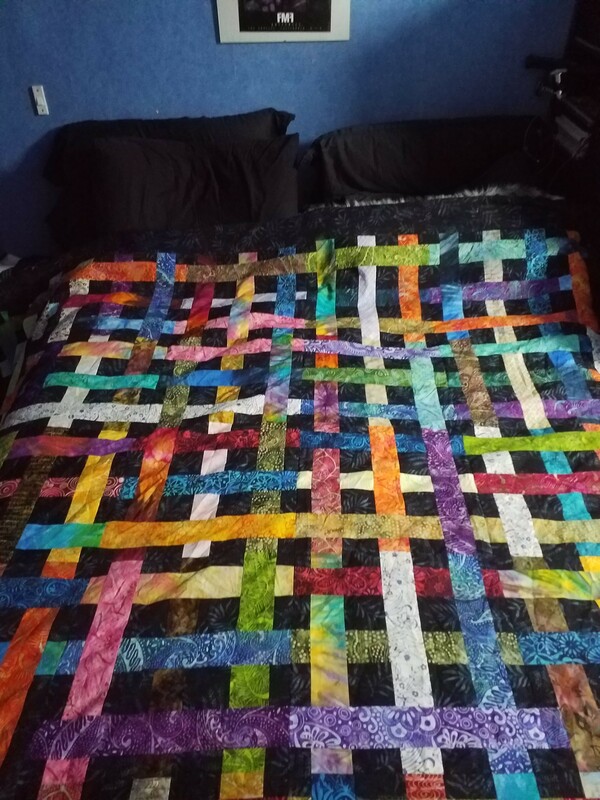 I started making blocks several years ago while I was doing a lot of traveling and thought it was time I finished the project and cleared the box for something else. I showed you one of the blocks a couple of posts back. I noticed the first few blocks I had made were not very good. So I started again, thinking I must have been tired or rushed or something, but my new blocks were still not right. They were better, much better, but not my usual standard. I figured what the heck, I wasn’t going to show it so who cares. I will finish it, use it and not worry. When I started putting the blocks together I finally found the issue. The precut jelly roll strips are not accurate. They vary by at least 3/8th of an inch. With 3 widths of that in each direction in each block there was no way I could get the blocks right. some of the joins between blocks are way off but thats just how it had to be at this point. These were cut by a reputable company, so in future I think I will have to measure every strip from every roll.